We provide Services for weed management, habitat restoration projects, High weed control, Blackberry, Poison oak, overgrown properties, vacant properties, Vineyards-Control of Sharp shooter fly and destroying its habitat, Steep areas where tractors can't get to, Fuel mitigation and the eradication of undesirable plant species. We provide communities with environmentally friendly vegetation management as well as public education about alternatives to traditional abatement techniques. We are family owned and operated. We are hoping to expand the use of goats as a tool for repairing damaged grasslands and clearing forests. Goats are a low impact animal. 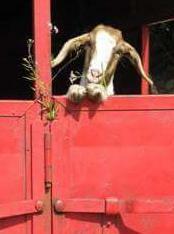 Goats prefer different forage, and are able to compensate for changes in plant dominance resulting from grazing. Goats will eat many highly invasive species that are undesirable by other grazers, such as Yellow Star Thistle that can cause chewing disease in horses. Horse Ranches- We bring in the goats and they completely eradicate the yellow star thistle from horse paddocks it can be costly to have empty paddocks that you can't rent out. The goats pull the plant out by the roots. We do targeted grazing. Educational Projects- Ag Days we teach 5000 children from all over the community about agriculture and the benefits of farm animals at the Sonoma fair grounds. We spend our money local and appreciate you choosing a local company like us.